Too Much Blight: If the last Blight comes off of the Blight Card, you follow the instructions there, which are often "you lose". Any Spirit is Destroyed: If any Spirit has no Presence left on the board, you lose. +Time Runs Out. If you need to draw an Invader Card (to Explore), but the Invader deck is empty, you lose. Terror Level 1: No Invaders on the island. Terror Level 2: No buildings on the island. Terror Level 3: No Cities on the island. Terror Level VICTORY: Immediate win! If a single effect causes you to both win and lose, you win a sacrifice victory: you are destroyed, but the island, the Dahan, and many other spirits survive. Fear is generated by Spirit Powers with the Fear symbol ( ) and by destruction (either directly by an effect or by Damage): destroying a Town generates 1 Fear and destroying a City generates 2 Fear. Fear terrifies the Invaders as a whole. For each Fear generated, advance one Fear Marker from the Fear Pool on the Invader board to the Generated Fear area. 1 When all of the Fear Markers have advanced, 2 move the top card of the Fear Deck face-down into the Earned Fear Cards area. If this reveals a Terror Level divider, move it to cover the old Terror Level (which starts at Level I, preprinted on the board). 3 Move the Fear Markers back to the Fear Pool; if you have leftover Fear after earning a card, move that many Fear Markers to the Generated Fear area. 4 Cards in the Earned Fear Cards Space are flipped and resolved during the next Invader Phase. Like Powers, effects of Fear Cards last for the current turn only, unless they change the board in some way. After each Fear Card is resolved, 5 move it to the Fear Discard Space. When you reveal a new Terror Level divider, the new Terror Level and victory conditions take effect immediately, so you might instantly win! 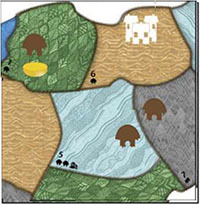 The game is played with one island board per player, laid out to make an island. 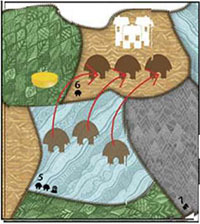 Each island board is divided into eight numbered lands, with exactly two of each terrain (Jungle, Mountain, Sands, and Wetland). Most pieces only affect other pieces in the same land, unless explicitly specified. Two lands are adjacent' when they touch, even if they're not on the same island board or meet only at a corner. Each board also shows a swath of Ocean, to indicate which lands are readily accessible by sea. Lands adjacent to the Ocean are Coastal. Lands not adjacent to the Ocean are Inland. (The other island borders are rocky cliffs and do not count as Coastal). The Ocean itself is not a land, and is not in play. The reverse side of each island board shows a thematic map that can be used to play once you're more familiar with the game. Spirit Presence marks the lands a Spirit occupies. Lands with your Presence are sometimes referred to as "your lands". If your Presence is ever destroyed (for example, by Invaders Blighting the land), it is removed and put next to the Island. If any Spirit ever has no Presence left on the island, the players immediately lose. A land can hold any number of Presence from any number of Spirits. Game effects which do things with Presence (such as move it or destroy it) always affect Presence on the Island unless they say otherwise. A Spirit's Sacred Sites are any lands where that Spirit has more than one Presence. Some Powers can only be used from these places of focused influence. They can only play as many cards as they have Card Plays available, which is the highest revealed number on the Card Plays Presence Track. They must have enough Energy to pay for the cards they play. Every turn, each Spirit gains Energy equal to the highest revealed amount on their "Energy/ Turn "Presence Track. Unspent Energy carries over to the next turn. Energy is individual and cannot be transferred between Spirits. Card Plays are also individual and cannot be shared with other Spirits. Unused Card Plays do not carry over to future turns. A card's Energy cost is in the circle in the top left corner of the card. Energy can be gained from Growth Options or the "Energy/Turn Presence Track on the Spirit Panel. 2 Art: An image of this Spirit. 3 Backstory: The story and history of the Spirit. 4 Setup: Initial Presence placement, and any special instructions. 5 Play Style/Complexity: A brief description of the Spirit's strategy and comparison of its strengths and weaknesses, as well as a summary of Powers. 6 Special Rules: Any rules that work differently for this Spirit. 7 Growth Options: The Spirit's options for regathering of strength, reaching out to new lands, and learning new Powers. When a Spirit chooses a Growth option, they will select one section and take all of the actions indicated in it, unless specified otherwise. Reclaim all played Power Cards from your personal discard pile, returning them to your hand. 8 Presence Tracks: Each Spirit Panel contains two Presence Tracks. The top one is Energy Gained per turn and the bottom one is Card Plays. To start, all but the leftmost space on each track is covered by Presence. When placing Presence on the island, you can choose which track to take it from, but always take it from left to right. As you remove Presence from each track you reveal progressively greater benefits. Removing Presence from the top track grants you more Energy each turn, while removing Presence from the bottom track allows you to play more Power Cards each turn. Spirits use only the highest revealed number on the tracks for their Energy or Card Plays (these benefits are not additive). Note: Destroyed Presence is removed from play, not returned to the Panel! Some Spirits have a Reclaim One space. While this space is revealed, the Spirit may return one Power Card to their hand any time during the Spirit Phase (so the ability can be used the turn it is revealed), letting them go longer before having to take a Reclaim All" Growth option. Some Spirits have bonus Elements on their Presence Tracks. These constantly provide one of the shown Elements for as long as the space is revealed. A space marked with +Any grants one Element each turn: the Spirit may choose which Element they get at any time, but then cannot change it until the next turn. It is rarely relevant, but whenever you would add Presence, you may choose to instead move one of your Presence already on the board. So, if you manage to get all of your Presence into play, you can still reposition it. 9 Innate Powers: Free Powers that can be triggered using Elements. Unless explicitly specified, Innate Powers never cost Energy or use Card Plays. Like all Powers, they target a single land or Spirit unless explicitly stated otherwise. The Invaders have begun to colonize your island! While not specifically aiming to exterminate you, their colonization and taming of the land has upset the natural balance. The goal of the game is to drive off the Invaders by meeting the victory conditions of the current Terror Level. As more Invaders learn to Fear you, the victory conditions will get easier! Invaders in a land do not automatically harm Spirit Presence or Dahan there. Invaders harm things only when Ravaging. Each type of Invader has a specified Health. To destroy an Invader, you must deal Damage that meets or exceeds its Health in one turn. Some effects also destroy Invaders regardless of Damage or Health. There are three types of Invaders: Explorers, Towns, and Cities. A land containing any number of these is a land with Invaders. 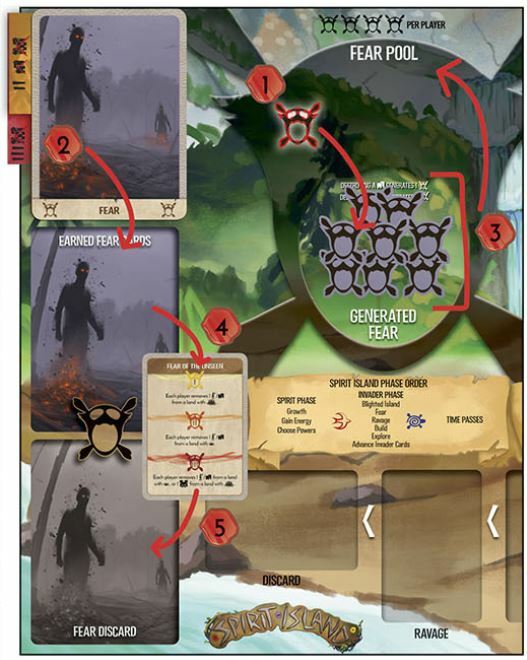 The number of Invaders is not limited by the supply of pieces; in the unlikely case that you run out, use 3-Energy tokens as 3 of this piece markers. Explorers represent Invaders willing to travel into uncharted wilderness: mapping expeditions, the very boldest homesteaders, etc. They have 1 Health and deal 1 Damage during Ravage. Towns represent homesteads and small frontier settlements. They have 2 Health and deal 2 Damage during Ravage. Towns act as a source of Explorers when Invaders Explore. Cities are the largest and most pernicious type of Invader piece. They have 3 Health and deal 3 Damage during Ravage. Cities act as a source of Explorers when Invaders Explore. Destroying Towns and Cities affects the Invaders morale. Whenever a Town is destroyed, it generates 1 Fear. Whenever a City is destroyed, it generates 2 Fear. Invaders slowly but inexorably Blight the land. A certain amount of Blight is normal in nature - such as damage from a forest fire - but too much will overwhelm the island. When you add Blight to the island during play, take it from the Blight Card - which starts Healthy side up - or Blight Space on the Invader board. If you remove Blight from the island, return it to the Blight Card. If you run out of Blight on the card, follow its instructions - either lose or flip the"card over and do what it says on the reverse". Flipped Blight Cards do not flip back; the island cannot heal from Blighted to Healthy within the timespan of the game. Destroy Presence: In that land, destroy one Presence from each Spirit with Presence there. Destroyed Presence is placed next to the island, not returned to the Spirit Panels. Cascade: If the land already had any Blight, also add one Blight to any one adjacent land. (If that adjacent land also has Blight, it will then cascade again from there, etc). The Dahan are the native human inhabitants of Spirit Island. They coexist well with the land and the Spirits. They also aren't too thrilled about the Invaders colonization, but are wary of initiating violence. Each island board starts with 6 Dahan pieces. Population growth in the game's timespan occurs only with a few Powers which grant blessings of health, fertility, and good harvests. The number of Dahan is not limited by the supply of pieces. Dahan only attack Invaders when a Spirit Power prompts them to do so, or when attacked themselves: after Invaders Ravage a land, any surviving Dahan in that land each deal 2 Damage to the Invaders in that land. Each Dahan has 2 Health, meaning they are destroyed by 2 Damage from Invaders. Damage from Spirits does not hurt Dahan, although some Spirit Powers cause Dahan casualties as a terrible side-effect. 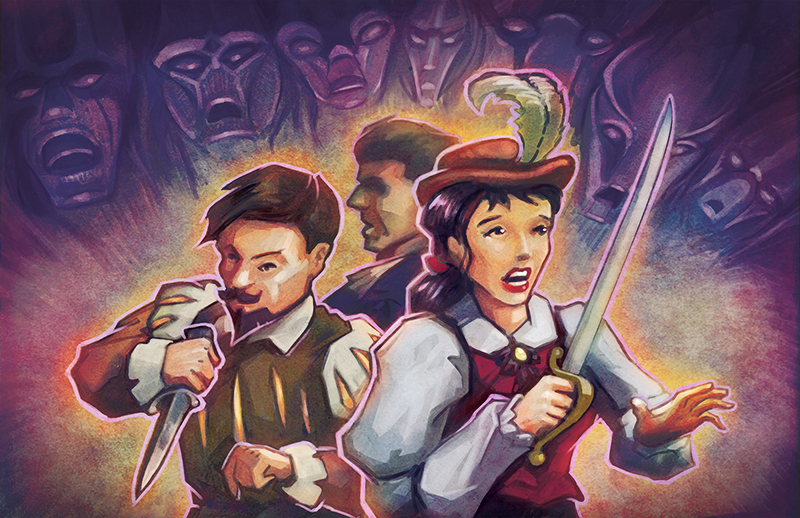 Spirits affect the game using Powers, which are either Power Cards or Innate Powers printed on a Spirit Panel. 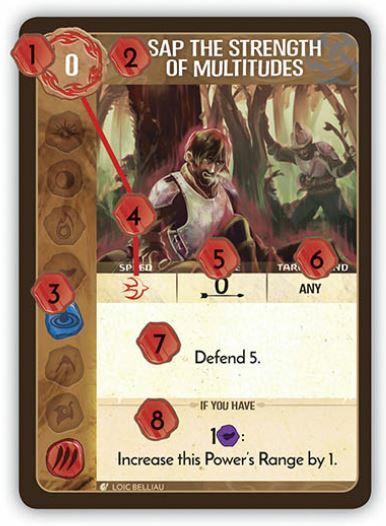 Innate Powers function similarly to Power Cards, except they are automatically available every turn (i.e. do not use Card Plays) and require having certain Elements rather than spending Energy. 1 Energy Cost (Power Cards only). 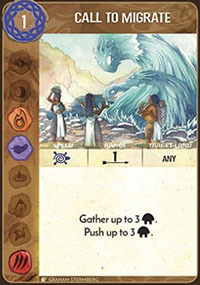 3 Elements Gained (Power Cards only): There are eight Elements: Sun, Moon, Fire, Air, Water, Earth, Plant, and Animal. When you play a Power Card, you gain the Elements shown. Some Powers have extra effects if you have gained specific Elements. Elements do not carry over from turn to turn. You gain Elements the moment you pay for a Power Card, regardless of whether the Power is Fast or Slow, and they go away as soon as it leaves play (usually during Time Passes). 4 Speed: Fast Powers ( ) resolve their effects before the Invader Phase, while Slow Powers ( ) resove their effects afterwards. Power Cards also show their speed by a red or blue ring around the Energy cost. 5 Range: How many lands away from your Presence this Power can reach. This is a maximum; you can always use a shorter Range. A Range of 0 means a land where you have Presence. 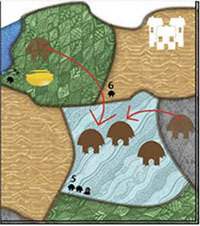 Some Powers have limitations on what sort of land you can use them from (such as only from a Sacred Site, or only from a specific terrain); these are shown left of the range icon. 6 Target: What land type this Power can affect. Most Powers can target any type of land, but some are restricted by terrain, what's in the land, or whether it s Coastal/lnland. Powers always target one single land unless explicitly stated. Some Powers target a Spirit instead of a land. (See back cover for Targeting reference). Perform effects in order, skipping any that cannot be followed. Effects that do not change anything on the board - such as Invaders do not Build in target land" - last only for the current turn. 8 Elemental Thresholds: Optional effects which may only be used if the Spirit has gained certain Elements this turn. The required Elements are not "used up"; the threshold is simply a check to see if they are in play. For instance, a Spirit with 2 Water in play could meet any number of thresholds requiring 2 Water. You may always resolve a Power as if you had fewer elements than you actually do. If you meet more than one threshold under a Power, do each of them in order, from top to bottom. Exception: If a threshold says Instead", it replaces the effects of previous levels. When resolving a Power's effects, do as much as you can. If one part does not apply or cannot be done, skip it and do the rest. The only targeting restrictions are those in the target bar. If you cannot or do not want to use a Power you've played - perhaps the board situation has changed - you're allowed to skip its effects entirely, as if it had a blank text-box. If it was a Power Card, you don't get your Energy back, but you do still get to use the Elements granted by the card. Similarly, when resolving a Power with thresholds, you may act as if you have fewer Elements than you really do, to avoid hitting thresholds. General Principle: One Land! One Turn! One Use! It only affects one single target land. Destroy up to 3 Explorers" will let you destroy up to 3 Explorers in the same land - not in multiple different lands. If a Power has multiple effects, they ALL apply to the same land. It only affects the current turn. "Dahan have +3 Health or Invaders do not Ravage in target land affect this turn only, not the rest of the game. Any permanent changes to the game will be represented by changes to a board - pieces leaving, Fear Markers moving, etc. It can only be used once this turn. You cannot choose to pay for a Power Card twice and use it twice. Innate Powers only trigger once even if you have twice as many Elements as you need. If something makes a Slow Power Fast, you only get to use it during the Fast Phase, not both. A few Powers have temporary effects on a land (such as Invaders skip all Actions"). There are reminder tokens you can use to mark those lands for the turn if you want; just remember to remove them at the end of the turn! You will usually gain new Power Cards via Growth, but some Power effects can grant them. New Power Cards always go into your hand. Choose whether you re gaining a Minor or Major Power. Draw 4 cards from that deck. If you need to, reshuffle the deck s discard pile. Keep one drawn Power Card in your hand. Discard the others into the discard pile for that deck. After you gain a Major Power, you must Forget - permanently lose - one of your Power Cards. Put the Forgotten Power Card into the discard pile for its deck. Place it under your Spirit Panel if it is one of your Unique Powers. If you are playing with a Power Progression, instead of drawing 4 and keeping one, simply take the next card in your Progression. What Power Cards Can I Forget? Any of your cards! From your hand, your discard, or (if you somehow gain a Major Power mid-turn) from your cards in play. It can even be the Major Power you just chose. If you Forget a Power Card from play, you immediately lose the Elements it provided, and if you haven't used it yet, you don't get to. If you already used it, its effects continue until end of turn as usual. Some effects remove Invaders, representing them fleeing in terror. Return the specified pieces to the supply. Some replace Invaders: first you remove the Invader, then you put something else in its place. A replaced Invader keeps any Damage it had. More Powers destroy Invaders outright. Return the specified pieces to the supply. Destroying a Town generates 1 Fear and destroying a City generates 2 Fear, but removing or replacing does not. Whenever a Power or other effect says Damage , it always means Damage to Invaders unless explicitly specified otherwise. When dealing Damage, it is done to any Invaders in the target land, divided among them however you choose. If an Invader has taken Damage equal to or greater than its Health, it is destroyed immediately. Damage may be combined from multiple Powers. However, at the end of the turn any remaining Damage on survivors. Invaders are not the only recipients of Damage in Spirit Island: the land and Dahan can take Damage from Invaders Ravaging. But the overwhelming majority of Damage in the game is done to Invaders. Any time a Power, Fear Card, or other game rule does Damage, it always means "Damage to Invaders" unless explicity specified otherwise. Most Spirit Powers do not harm the land or Dahan. There are no tokens in Spirit Island for tracking Damage. Instead the models are built to be rotated to help track Damage done to them. Whenever you destroy a City or Town (via Damage or otherwise), it frightens the Invaders. You generate 2 Fear for each City destroyed and 1 Fear for each Town destroyed. If you remove or replace a City/Town, it does not generate this automatic Fear. Some Powers let you Defend a target land, which reduces Damage done by Invaders to the land and/or Dahan. "Defend 2 means "Whenever the Invaders deal Damage to target land or Dahan there this turn, reduce the total amount of Damage they do by 2". If multiple Defend effects are used in one land, they add together. Defend effects last for the entire turn. There are optional tokens you can use to help you remember that a land is Defended this turn. When you remove Blight from the island, return it to the Blight Card, on whichever side is currently face-up. The Blight Card will not flip from Blighted back to Healthy during the timespan of the game, no matter how much Blight you remove. Some Powers tell you to Gather things into the target land (such as "Gather 1 or Gather up to 3 @a.jpg"). This means Move that many things into the target land from land(s) adjacent to it". Gather only pulls things in from adjacent lands; boosts to a Power s Range do not affect Gathering distance. Other Powers tell you to Push things from the target land (such as "Push 1 @l.jpg" or Push up to 3 ). This is the exact reverse of Gather. It means "Move that many things out of the target land, to adjacent land(s)". Push only sends things one land away; boosts to a Powers Range do not affect Pushing distance. If Pushing multiple things, they may go to different lands or not, as you wish. You can only Push into a valid land, not off the board or into the Ocean. Invaders are currently set up to Ravage in the Sands next turn. The players want the nearby Dahan to fight back against that City in land #6. Using the card 'Call to Migrate', the yellow Spirit Gathers 2 Dahan from adjacent lands into the target land #5. Then, the Spirit uses the second half of the cards effects to Push 3 Dahan from target land #5 into land #6. Now, when the City Ravages, it will destroy one of the Dahan and add a Blight, but the other two Dahan will fight back and destroy the City. Repeating a Power lets you activate its effects again. It does not give you Elements again (you gain Elements for putting a Power Card in play, not for using its effect) and Repeats cannot be chained (ignore any Repeat effects on a Repeated Power). Changes to a Power carry over to the Repeat use. (For instance, if a Power is made Fast or given additional Range, that also applies to the Repeat). You may make different choices when Repeating a Power. If a Repeat specifies where to use it, obey those instructions (instead of the usual Range and Target restrictions). Otherwise, you can choose any valid target by the usual rules, including the same target as its first use. Repeating a Power Card does not count as playing another Power Card. (For the purposes of, e.g., Boon of Vigor).